Welcome to the Tsikeli Hotel. During your stay here will provide you with several room configurations, giving you just the right accommodation for your travel needs. Guests at Tsikeli hotel enjoy the signature of Hospitality. We are here to make your stay memorable, from the warm welcome at reception, to your clean, comfortable and well-appointed accommodations, to our garden enjoy the stuning view and let us organize your activites. Our success is demonstrated by our great repeat guest rate. So, come and enjoy the Meteora View. Tsikeli hotel in Meteora is a Family run Lodging with traditional design located in the Village of kastraki in your way to Meteora,(400 Meters from the first Monasterie) . Our eco-friendly 3-star hotel respect the Guest and his needs. We offer stylish guest rooms and unique view from our Garden, ideal for long and short term stays. You can relax in our garden with its unique view and its comfortable woodcraft couch or surf the internet with our free Wi-Fi access. Throughout your stay you can enjoy a, with love, prepared coffee or tea in our bar, which also serves organic drinks and spirits. This is guests' favourite part of Meteora, according to independent reviews. 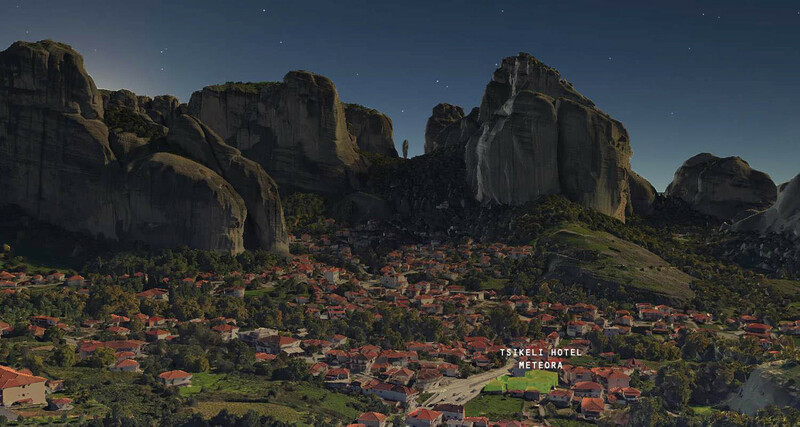 Hotel Garden faces the magnificent Rocks of Meteora,all our guests enjoying the natural beauty of the surrounding area. At check-in it is provided local area map to all the guests, info of the are and activites. Waiting for your request ..
*Take away breakfast or Meal on request. We always pay attention to the finer details so the guest will feel comfortable and relaxed. The first monasterie is located just 400 meters from the Hotel and the nearest hiking path is 300 meters ,it is the ideal spot to start exploring the Area. We always pay atention to clients needs and we offer new packages to make their stay enjoyable and welcoming depending on the time of the Year and the Guest preference.